The parish of Wramplingham is situated in the south of Norfolk. It lies north of Wymondham, west of Great Melton, east of Kimberley and south of Barford. The name Wramplingham has an uncertain derivation. ‘Wramp’ may refer to a personal name in Old English, whilst the ‘lingham’ states that it was the homestead of this individual’s people. Whatever the case, the parish has a long history and was established by the time of the Norman Conquest. Its population, land ownership and productive resources were detailed in the Domesday Book of 1086. This document revealed that Godric held the parish after the Norman Conquest and that Wramplingham had a stake in a mill at the time of the survey. The earliest evidence for human occupation in the parish takes the form of prehistoric flint pot boiler scatters. These fire-cracked flints (NHER 21268 and 21296) represent individuals heating water for washing and cooking purposes. Other early prehistoric tools include flint flakes (NHER 17160) and a hammerstone (NHER 22743). Analysis of other lithic artefacts from the parish shows them to be of Neolithic date, and these artefacts comprise scrapers (NHER 19749), blades (NHER 19749) and an axehead (NHER 19976). The archaeology recorded for the subsequent Bronze Age period includes several possible ring ditches (NHER 15762 and 15767). The cropmarks of these were identified on aerial photographs taken in 1977, and the ring ditches may relate to round barrows. Several small finds from this era have been recovered and these comprise flint tools (e.g. NHER 19750), a copper alloy sword fragment (NHER 17547) and sherds of pottery (NHER 17160). However, few Iron Age artefacts have been reported, with only an Icenian silver coin (NHER 34322) and harness fitting (NHER 34457) being noted. Unsurprisingly, the majority of objects from the Roman period are coins (e.g. NHER 20351, 33056 and 33078) that have been recovered through metal detecting. Other items of Roman date include a beautiful seal box (NHER 34457), various brooches (e.g. NHER 17647 and 25697), part of a spoon (NHER 33051), a military strap end (NHER 33052) and a phallic pendant (NHER 34457). At present no Roman sites have been identified in Wramplingham. Some of the finest metal objects from the parish date to the Saxon period. 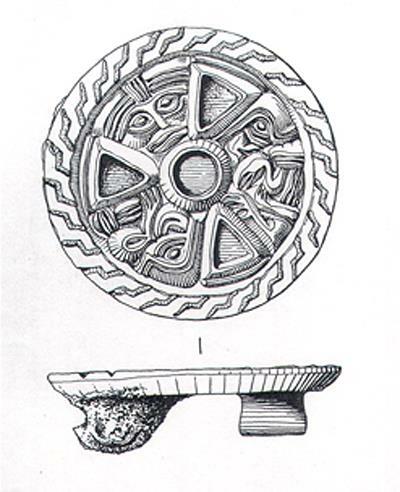 First and foremost of these are three 10th century disc brooches decorated in the Borre style (NHER 9253 and 25697). Several objects have been dated to the Early Saxon period, with a small-long brooch (NHER 33055) and buckle pin (NHER 25697) on record. The Middle Saxon period is represented by a complete pin (NHER 34457) and a nummular brooch (NHER 33055) (although this could date to the Late Saxon period). Late Saxon artefacts comprise a battered finger ring (NHER 34457) and various sherds of Thetford Ware type pottery (NHER 9253). The most obvious reminder of Wramplingham’s medieval heritage is the church dedicated to St Peter and St Paul (NHER 9283). This church features a 13th century round tower with a tall lancet doorway. The nave dates to the 11th/12th century but the chancel was rebuilt in 1448 and the arcade and north aisle date to 1872. The current churchyard is greater in extent than the medieval one. No other medieval sites or monuments remain, so the rest of the medieval evidence is provided by small finds. As is typical, several coins (e.g. NHER 33054) and pottery sherds (e.g. NHER 25073) from this era have been recovered. Other more interesting objects comprise the arm from a balance (NHER 18585), a casket key (NHER 35361), a seal matrix (NHER 33055), the guard from a dagger/knife (NHER 33052) and a lock mechanism (NHER 18584). During the post medieval period a number of buildings were constructed along Wymondham Road. Mill Farmhouse (NHER 48688) is a timber-framed building dating to the 17th century notable for the taller crosswing that was added at a later date. The River House (NHER 48526) is later in date, being an early 19th century construction, and has a symmetrical three-bay main façade with sash windows set beneath skewback arches. The final post medieval property in this area is the Old Rectory (NHER 45709). This building dates to 1851 and stands two storeys high with shallow projecting full-height gabled bays with decorative barge boards. The adjoining carriage house is of contemporary date. Of course the most illustrious building of this period is Wramplingham Hall, which was erected in 1840 (NHER 9278). It is built from gault brick with slate roofs and has two storeys and a basement. The main façade of five bays has sash windows and jalousie shutters. The recessed side wing is in a similar style to this main block. Another building worth a mention is Quaker Farmhouse (NHER 34415), which dates to 1642. This property was said to have been a Quaker Meeting House in the late 17th century and in 1999 a wall painting of 'blank verse prayer' was found behind six layers of wallpaper in the bathroom. Several of the farms in the parish also date to the post medieval period and these include Glebe Farm (NHER 41775), Manor Farm (NHER 29995) and Crow Hall Farm (NHER 17373). The only industry other than farming hinted at by the archaeological records is milling. Faden’s map of 1797 shows a watermill in Wramplingham at Mill House, although no trace of this mill survives into modernity. Brief mention should be made of the post medieval objects from Wramplingham. The best item comprises a 17th century Dutch knife handle decorated with enamelled foliage decoration in blue, white and dark blue. The remainder of the collection consists of mundane metalwork like spurs (NHER 33052), weights (NHER 25697 and 34457) and coin weights (NHER 25697). The most recent archaeological find is a lead weight inscribed with the date 1903 or 1963, although the inscription makes determining which of these dates is correct difficult. The most recently built structure recorded amongst the archaeological records for Wramplingham is a telephone booth (NHER 45661). This square cast iron box is of the K6 type designed and built in 1935 by Sir Giles Gilbert Scott. Thomas Sunley (NLA) 15 September 2007.